The listing was accurate regarding the location, with excellent views from the terrace. However, being adjacent to the M6098, the apartment suffered from traffic noise. The property was clean on arrival, but we found it 'tired' in appearance, with poor equipment (2 teaspoons, 3 forks, no oven dishes or baking trays, etc.). The bed pillows were cushions, and there were no pads for the wooden sun-loungers. On arrival we also noticed that the handrail at the bottom of the entry steps was loose, there was an electrical socket hanging off the wall in the kitchen, and in the bathroom there was a hole in the ceiling and a towel rail nearly off the wall. The lounge furniture was stained, and there was no TV or Internet. We did not see the owner until the evening of the last day, so we didn't know there was a washing machine in a cupboard behind an outdoor settee on the terrace. As the owner's dog slept on this settee we didn't want to move it, and never would have thought a washing machine was in there. Could not recommend this property to a friend or relative. The balcony was what convinced us to rent here. It provided a wonderful view that we enjoyed each morning while eating breakfast. The owner is very thoughtful, considerate, and helpful. The only downside was the amount of mosquitos-we had to buy repellent and keep applying it! It was a real pleasure to welcome Steven and his wife in my villa, very nice persons who kept the apartment very clean. I can recommand them 100%. What a delight to stay in this ideal apartment in a lovely villa. The apartment itself was very comfortable but the huge terrace with world class views of beautiful Villefranche Bay was a highlight. We loved dining on the terrace and were glad to discover a gourmet frozen food store called Picard, where delicious meals could be purchased and cooked in the micro. Great for tourists! This was our second stay in Villefranche. We enjoy the convenience of the bus and train as we could easily visit a different town each day. A huge thank-you to our wonderful host, Abi, who was responsive to our every need and request. We miss Pasha, the cat, and the Cache, the dog with the best personality ever! What a wonderful sympathique couple from canada to be known ! We had great stay in the apartment in the villa. It's furnished in Moroccon style, which makes the stay very pleasant. The kitchen is equipped OK, and there's enough room everywhere. But the best things is the big terrace offering a beautiful view at the bay of Villefranche. And the flowers on the terrace smell soo good! You'll immediately know you're on holiday. The city centre is only a 5 minute walk away, with nice restaurants and a bakery. The supermarket is in a town nearby, you can easily get there by car or bus. Parking is no problem, you can safely park on the street. Abi, the owner, was very kind a helpful. He has a dog and a cat that came out on the terrace quite often. I'm not a friend of dogs but this dog is so nice, you'll love him! Deux jeunes femmes de Stuttgart, très agréables et très comme il faut. "We traveled with a 2.5 year old son. Apartment is clean and equipped, nice beach and pretty village, 10 min by car to the Nice, the view is fantastic, friendly owners Abi Sophie Cuche and cats. (Text automatically translated) Restaurant, Tennis, bike rental. Near the Casinos of Beaulieu-sur-Mer and Monte Carlo, the villa Ephrusi de Rothschild. 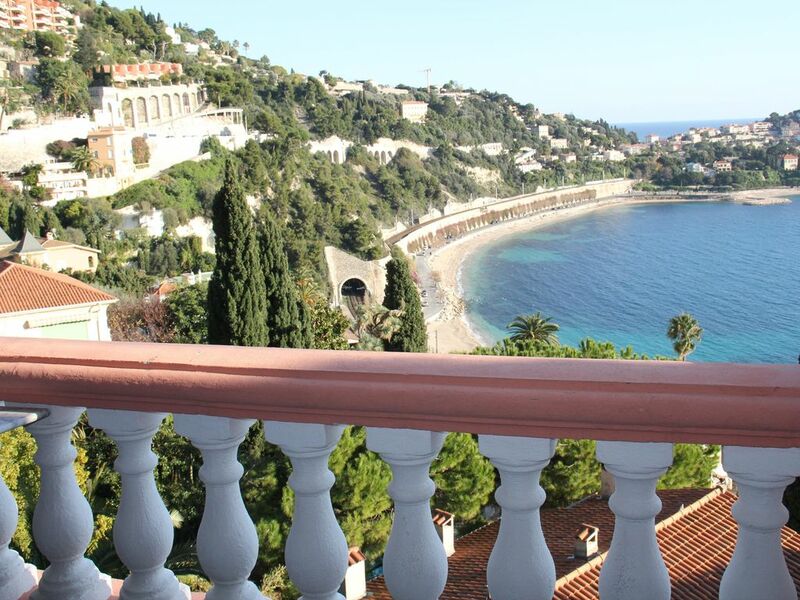 The most beautiful sea views over the bay of Villefranche! Remise des clés par le propriétaire qui demeure sur place.